Moffat County High School football players participate in a pre-game ceremony for Basalt's Oliver Harrington during the 2016 season. The display of sportsmanship was one of the top 10 moments for the Bulldogs during the past school year. The Moffat County High School athletics department has been out of competition for more than a month, though Bulldogs are taking little time off this summer as they prepare for sports this fall and beyond. While young athletes work toward the 2017-18 school year, the Craig Daily Press takes a look back at the year before and some of the top moments of the sporting department, which will be recounted in two parts. Following back-to-back conference titles and playoff appearances in 2014 and 2015, MCHS football was ready for third helpings in the postseason last fall. The year began roughly as multiple Bulldogs were felled by serious injuries in the non-league schedule, leaving the roster diminished and players shuffled around on the field. Moffat County kept at it as the year progressed and remained in the running for the lead of the 2A Western Slope League, which came down to a road game in Basalt. The night ended with a loss for the Dogs and a solidified championship for the Longhorns, though it was before the game even began that both teams won. 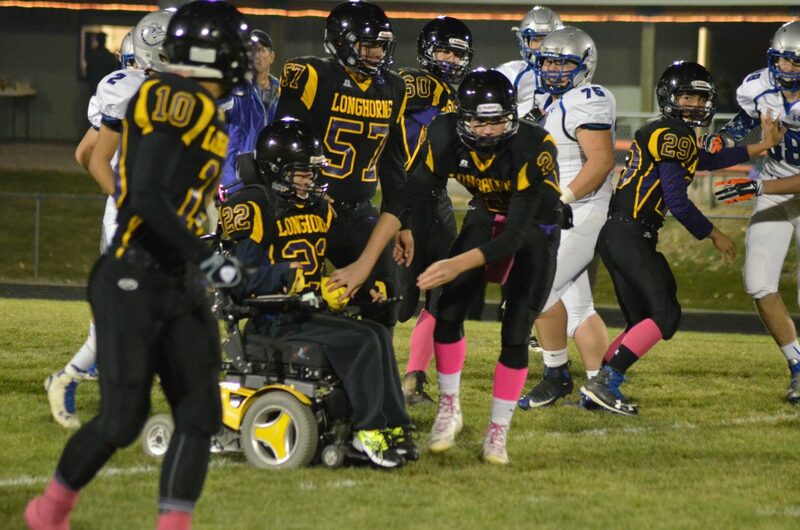 A pre-game ceremony for Basalt’s Oliver Harrington, a wheelchair-bound student, gave the young man a taste of scoring a touchdown in a game scenario, to which Dogs were happy to show their sense of sportsmanship by participating. Only recently has softball come to Northwest Colorado as an officially sanctioned sport through Colorado High School Activities Association, with Meeker building a program since 2014. The past year saw the greatest strides for the Lady Cowboys as they went as far as the opening round of the 3A state tournament, falling 13-1 to eventual state champs Rocky Ford. Among the team were several Craig students, including Mackenzie Marshall, Julia Christensen and Charisma Delgado, combining for 34 runs batted in during the season. A young group with most of its talent returning means anything can happen in the years to come with contributions from all over the region. MCHS cross country teams kept the pace throughout the season last fall with boys in particular showing their strengths in building over the past several years. A victory at the Bulldog Invitational for the male runners was followed by a second-place finish at the 3A Region 1 Meet, narrowly coming within the title won by Gunnison, the Bulldogs led by Riley Allen who placed sixth at regionals and 20th at the state race, which earned him All-State Honorable Mention from CHSAA. Likewise, Moffat County girls powered through smaller numbers after losing many runners to graduation, placing fourth at regionals to send the whole group to state. The tradition of pink games was alive and well in October as athletes paid tribute to the survivors and victims of breast cancer. Going beyond the pink ribbon that comes with the typical honoring, members of the football, volleyball and boys soccer were clad in the signature color during games dedicated to family and friends who had combatted the disease. Soccer players wore pink headbands and arm bands, while the girls of the volleyball program had their legs covered with pink ribbon socks provided by Memorial Regional Health as well as a pre-game ceremony for loved ones afflicted with the condition. Last but not least, football players rounded out the season with a pink game against Aspen complete with pink and white jerseys printed with sponsors, raising hundreds for American Cancer Society in the process. Longtime Moffat County sports fixture Steve Hafey passed away Dec. 9, 2016 at the age of 75, one day before an induction into the Colorado Football Officials Association Hall of Fame. Hafey contributed to the sports scene in multiple ways, most notably with 47 years as a referee at events across the Western Slope for football, basketball and wrestling ranging from youth to high school to college. Additionally, Hafey spent more than three decades as “the voice of the Bulldogs,” providing radio commentary for KRAI including local football and basketball and especially coverage of state wrestling.